What is exclusive pumping (or EP)? It's when a mother expresses her milk to feed her child, rather than feeding "straight from the source". 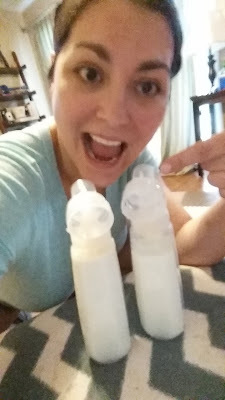 Prior to having Tyler, I knew very little about pumping, but I knew that since I planned to breastfeed and planned to work after maternity leave, I would need a pump. But that was about it. I remember the weekend before he was born sitting on my bed playing with the pump and thinking the manual was a foreign language. I didn't realize that that Medela Pump in Style Advanced would become my best friend and I'd know it like the back of my hand. We had a latch issue, and I'd seen the lactation consultant at the hospital a few times, but *I* could never get the hang of it. Then I needed to pump for a trip Rob and I needed to take - leaving Tyler with grandparents. (Leaving my 5-week old for a weekend was probably one of the hardest things I've ever done in my life!) I was determined to pump enough milk for while we were gone, so I learned that pump well. Since he was about 5-weeks old, I was CONSTANTLY checking in on him. Of course he was well cared for, and one thing was consistent - he always seemed much more satiated after a bottle, according to his grandmothers. 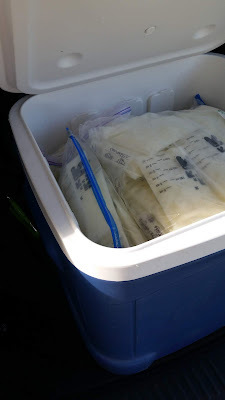 So, I bought lots of ice for a mini cooler I had in the car with us, and I kept the milk I pumped on the road trip home, keeping it cold and ready for him. I used that weekend away as an opportunity to try out pumping, and never went back. With Gwyneth it was a supply issue. I had A LOT. And the let down was so fast that she was choking. There were things I could do that would still allow me to breastfeed, but I knew I'd been successful with pumping, so when she was about 3 or 4 weeks I made the switch. What could I have done? I could have pumped through my letdown and then let her latch, or I could have expressed in to a diaper or rag until I letdown and then let her latch. That's all fine and good for someone that is not completely lazy when being woken up by a hungry babe at 3 am! I am not one of those people. Once it was all set and done I'd pumped for Tyler for 6 months, and Gwyneth for 12 months. Eighteen months! I should have gone longer with him, and I could have gone longer with her, and those are my only regrets to my pumping journey. And a quick plug before I go in to the tips and tricks - if you have an over supply, please please consider donating! Hospitals will use donated milk to feed NICU babies! I donated about 1500 ounces with Gwyneth and it was one of the most rewarding feelings. If you do decide to donate, please research first rather than just give to someone you don't know. And please, do not sell. I've seen facebook posts of people selling their milk. No. Just donate to babies in need! In those 18 months I learned a few things. I've been asked for advice a lot, so now I'm going to share it with the world! 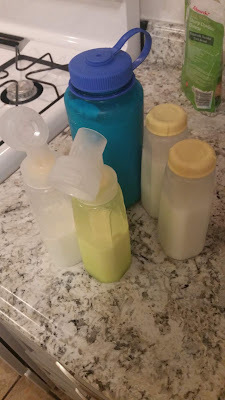 Keep in mind, of the three options to feed our babies, it might be the hardest and most time consuming, but it doesn't have to be hard (if your body cooperates - some women don't have the supply, some bodies do not react well to the pump, etc). - Buy extras! I recommend at least two sets of everything: connectors, flanges, tubing, valves and membranes. LOTS of bottles. And tip - the cheap bottles at Walmart and Target, that come in packs of 3 for like $2 fit the Medela PISA! Other bottles fit directly on the connectors as well, but I just used the cheapies and then also the Medela brand with Gwyn since those were the bottles she favored. - So. many. bottles. Here's what I did to alleviate some of the bottles. Similar to how I'd use parts throughout the day, I did the same with bottles. I'd pump, and then dump in to a large water bottle, then put in the fridge (or directly to freezer bags when that worked better for my situation at the time). I'd keep the bottles in the fridge as well, and then bring them out when it was time to pump again. There'd maybe be some thick cold milk attached to the side of the bottle, so I'd just use my finger to rub the outside, warming the milk and melting it to the bottom of the bottle, then pump away. - IMPORTANT NOTE: I do not know the science behind it, but you cannot combine warm and cold milk. SO if you do as I did, do not pour the new milk directly in your big bottle. 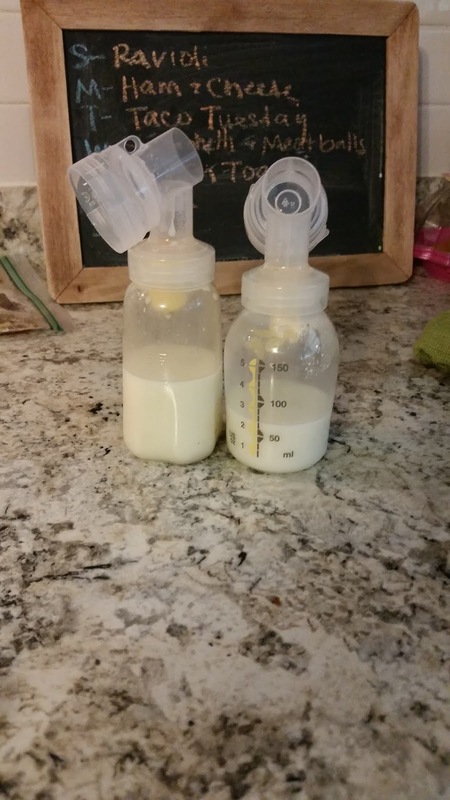 Put the bottles full of milk in the fridge until your next pump. When you pump again, the bottles are now cold and can be dumped with the other cold milk. - Buy a manual pump. I stuck this bad boy in a purse dust protector many times and would take to weddings, date nights, road trips, whatever. It was used quite a bit, and well worth the $25 I'd spent at the time. - Do you need a hands-free bra?! I recommend it for sure BUT you don't need to get a fancy one! Make your own! If you can find a sports bra with clasps in the back all you need to do is cut little slits where you need the flanges to go, and voila! I made my own and it lasted both kids. I don't sew, but it probably could have stood to have a little sewing around the edges of the slits for stability. Tip here - I just wrapped it around my body, I didn't use the straps. I maybe could have cut them off, but I never thought about that. - Freezer bags. ALWAYS have freezer bags on hand. My favorite were the Target ones. They were thicker, and cheaper. - Speaking of freezer bags - thawing. I would either take out what I would need the next day the night before, and leave in the fridge. If I forgot and knew I'd need one in a few hours I'd take out and let sit at room temp for a few hours. When I'd forget that, you can use tepid/slightly warm water to thaw. Tip here - put the freezer bag in zip top bag. I rarely had the Target bags leak, but leaks happen. If the bag is in another bag and it leaks, you can still use the milk! There was nothing worse than a crying baby desperate for food, and then seeing that milky water in the bowl where I was thawing his or her milk. - Suction. Why did my pump lose suction?! First, check that the tubing isn't pinched and it's fully plugged in. If that's not the issue, then check the membranes. Even the slightest most minuscule of tears will totally steal the suction from your pump. See picture below - the yellow is the valve, the white is the membrane! - The suction is OK, but it is painful! First, play around with the strength that you're using. If it's painful on all of the speeds, then perhaps your flange is not the right size. I believe most pumps come with a 24mm flange, but our bodies are not one size fits all. Maybe you need a bigger size, or a smaller size. I could not use the 24mm that came with mine and had to buy 27. See picture above! - Speaking of cooler bags - any thing will work, you don't need the bags that fit the bottles for your pump. Those will only fit the small bottles, and if you have an oversupply at all, you need bigger bottles!! Whew, that's a lot. I am sure I have more, and as time goes on, I may edit this, but for the time being, if you're considering pumping, or want more information, I hope this helps. KellyMom - this was my go-to for all questions!